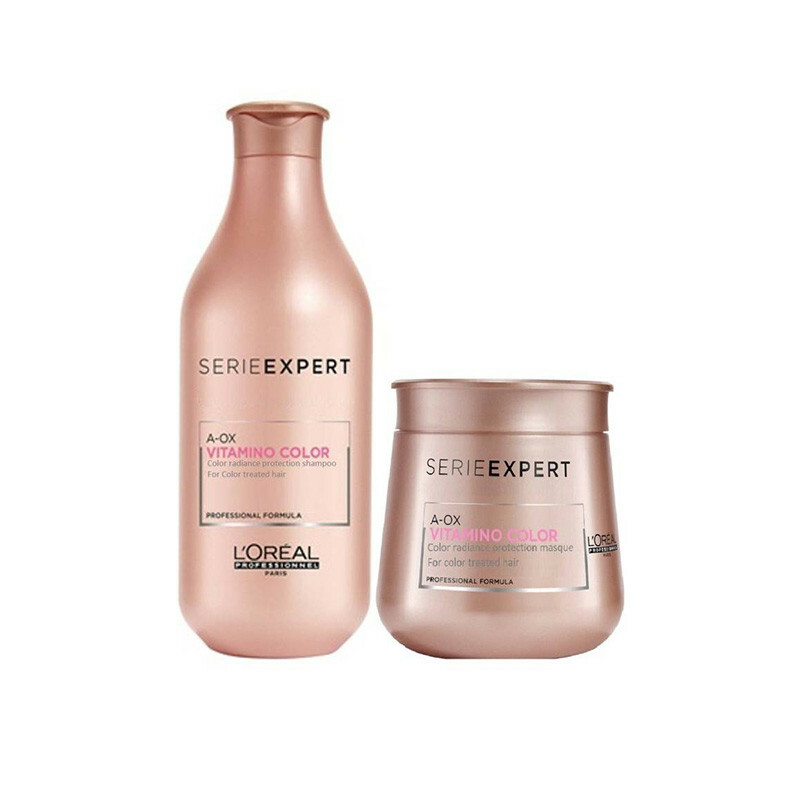 L'oreal Serie Expert Vitamino Color Shampoo Suitable for colour-treated hair, the luxurious liquid gently removes excess oil, dirt and impurities from your hair and scalp, whilst adding luminous shine to leave hair vibrant and healthy-looking, without weighing it down.Specially formulated with the brand's A:OX technology to deliver a high sheen finish and enriched with panthenol to penetrate deeply into the hair shaft to maintain moisture levels.The nourishing Vitamino-Color A-OX Masque targets weakened and damaged areas of coloured hair and wraps it into a lightweight film to protect against every day wear and tear. Colour-treated hair is intensely nourished and protected in just 60 seconds. ndulge in the sensorial colour radiance protecting Vitamino Color AO-X shampoo that leaves coloured hair feeling instantly soft. Enriched in an anti-oxidant complex and UV filters. Your colour of choice looks more vibrantly shiny. Residue is eliminated, while colour radiance is protected.